Our classic balloon modelling kit in new House of Novelties packaging. Contains 32 colourful balloons, hand pump, stickers, and instructions for modelling. Our classic balloon modelling kit in new House of Novelties packaging. 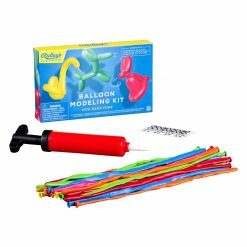 Contains 32 colourful balloons, hand pump, stickers, and instructions for modelling.